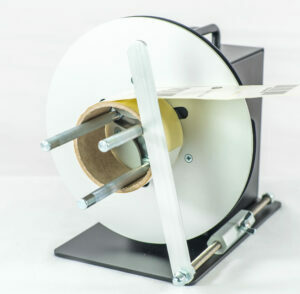 The MC-10 handles labels up to 125 mm wide and will wind a roll of labels up to a 220 mm diameter. The new build-in potentiometer allows to control the amount of rewind speed/torque. No awkward, troublesome belts or clutches are used and no speed adjustments are required. The Mini-Cat has an inner label flange to keep the edge of the label web aligned as the labels are being rewound. Reliable, high quality and maintenance-free, the Mini-CAT Label Rewinder features a 5-YEAR PARTS and LABOUR LIMITED WARRANTY (1-Year on power supplies), the longest in the industry.